Students at Falls-Lenox were greeted with warm smiles and welcoming words as parent volunteers from the Falls-Lenox PTA joined staff members to help guide our young bulldogs. With class lists in hand, parents and staff welcomed students to the 2010-2011 school year, and helped direct them to their new classrooms. 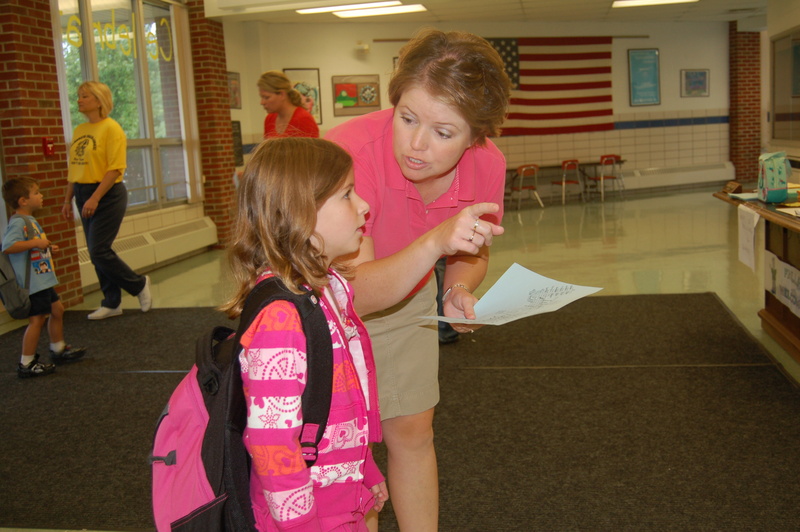 Below: Falls-Lenox PTA parent volunteer Christie Patton helps direct a student to her new classroom. To view additional first day photos from Falls-Lenox Primary School, please click here. Emergency Contact Cards were sent home with students in grades 1-5 and grades 7-12 on the first day of school. (6th grade students received their Emergency Contact Cards at Open House on August 18th.) PARENTS: Please review all information carefully to confirm accuracy and return to your child’s building no later than this Friday, August 27th. All medications must be sent in the original container. Wed., Sept. 15th: ECC – A.M. Preschool/Kindergarten 6:45-7:30 p.m.; P.M. Preschool/Kindergarten 7:30-8:15 p.m. Thanks to the $7.7 million in State funding secured by the Olmsted Falls School District through the Ohio School Facilities Commission’s Exceptional Needs Program, Olmsted Falls Middle School opened its doors this week with 17 new classrooms, an additional choir room, two additional band storage areas, an expanded wellness/fitness room and expanded locker room areas. All of the new expansion to the Middle School was completed on-time and on-budget – and without additional, local tax dollars. Pictured above: One of the 17 new classrooms. 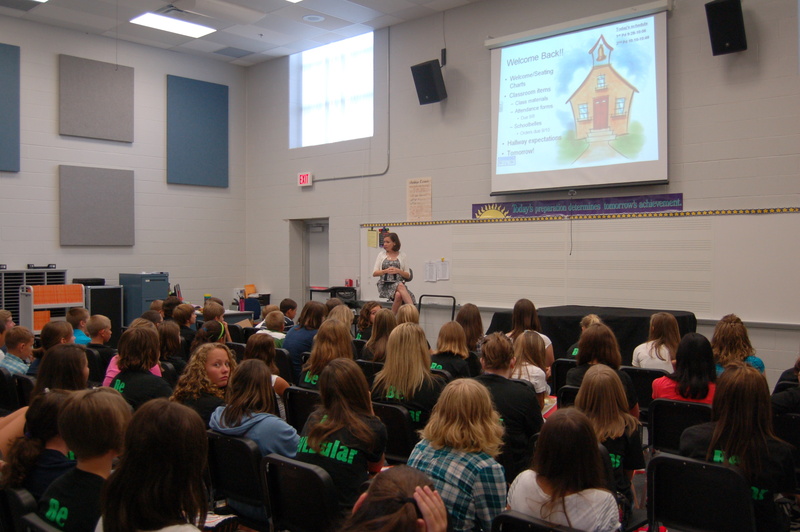 Pictured below: New choir room at the Middle School. To view additional photos from opening day at Olmsted Falls Middle School, please click here. Tuesday, September 14th: Middle School PTA – 7 p.m.
Tuesday, September 21st: Intermediate School PTA – 7 p.m.
Monday, September 27th: High School PTA – 7 p.m.
District officials recognized employees for their years of service to the District during the annual General Staff Meeting held Monday, August 23rd. Employees with 1, 5, 10, 15, 20, 25 and 35 “Bulldog years” were acknowledged for their contributions to the District’s success. Pictured below are “25 Year Bulldogs” Mrs. Mary Mariotti (Falls-Lenox), Ms. Chris Warren (High School), Mr. Bill McGrain (High School), Mrs. Cindy Bennett (Middle School) and Mrs. Nancy Gulden (Middle School). Olmsted Falls School District Treasurer Mark Hullman has requested a voluntary increase in his personal contribution to his health insurance premium from 10% to 15%. The Board of Education has made the requested revision to Mr. Hullman’s contract, and expressed appreciation for Mr. Hullman’s demonstrated leadership in helping the District cut costs. Olmsted Falls City School District and neighboring North Olmsted City School District have been working together to resolve a tax error in the County Auditor’s office that resulted in the erroneous collection and payment of approximately $300,000 in taxpayer dollars to Olmsted Falls Schools, which should have been collected and paid to North Olmsted Schools. District officials on both sides have been working to ensure due diligence in understanding where the error occurred, and verifying the correct collection and payment of the dollars moving forward. It has been determined that a clerical error by the County Auditor’s office, which occurred during file maintenance, inadvertently shifted a page of properties from North Olmsted Schools to Olmsted Falls resulting in the inaccurate collection/payment of funds for calendar years 2009 and 2010. Olmsted Falls School District will be repaying the funds back to North Olmsted School District over a period of two years – the same period of time during which the error occurred. Olmsted Falls School District Treasurer Mark Hullman also continues to work with the County Auditor’s office to consider whether Olmsted Falls School District should be reimbursed for expenses incurred related to the error (i.e. collection service fees, legal expenses). The Ohio Department of Education requires all school districts across the State to submit current 5-year forecasts of district finances. 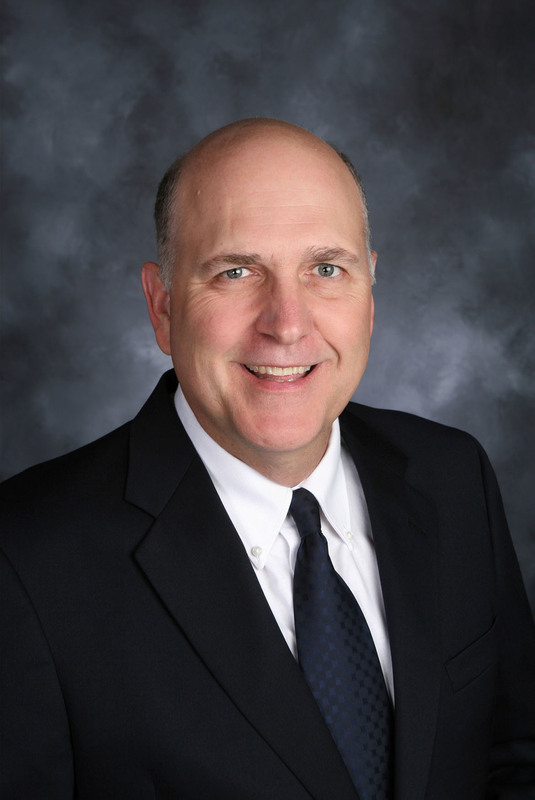 Olmsted Falls School District Treasurer Mark Hullman, administrators and Board of Education members, will continue to work together in the coming weeks to finalize the latest 5-year forecast for the District. Current projections indicate that District officials should be able to stretch revenues from the recently passed 8.7 mill levy for the three years promised during the operating levy campaign last February. This new levy will begin generating revenue for the District beginning in January 2011. However, uncertainty regarding the upcoming State budget (with currently more than an $8 billion deficit to be covered), growing foreclosure and delinquency rates, and a still struggling economy, will continue to keep the financial security of our District in an extremely fragile position. With less than a week before the start of the new school year, faculty and staff throughout the Olmsted Falls School District are busy preparing for the arrival of our students on August 24th. We look forward to welcoming everyone back for what promises to be another successful year in Bulldog country. By now, all families with students enrolled in the District should have received their special Back-To-School issue of the School Report. This issue contains much information relevant to the start of the school year. This issue can also be viewed on-line by clicking here. With positive feedback from parents, the District Blog Updates will continue for the 2010-2011 school year. It is our plan to post a new blog update EACH WEDNESDAY that school is in session throughout the school year. Be sure to verify your current e-mail address on your student’s Emergency Contact Card(s) so that your e-mail will be in the database to receive notice of these weekly updates, as well as periodic building-specific information. 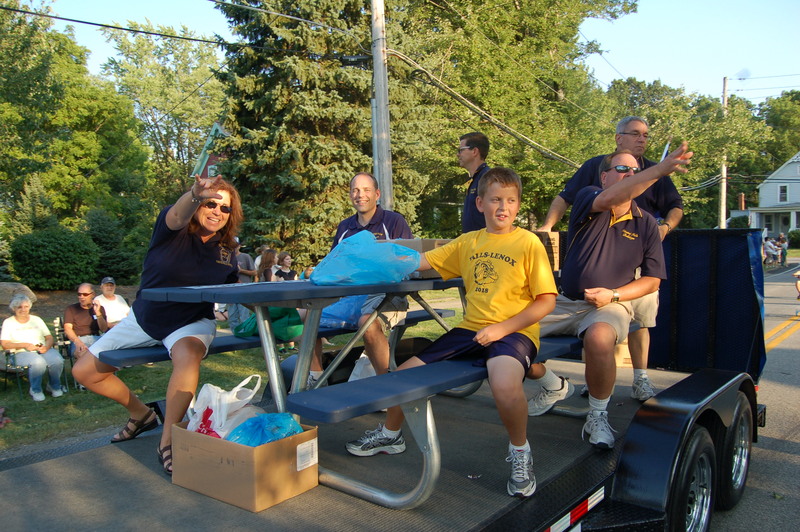 On behalf of the faculty and staff of Olmsted Falls Schools, we hope all of our families enjoy these final days of summer and look forward to seeing everyone on Tuesday, August 24th. 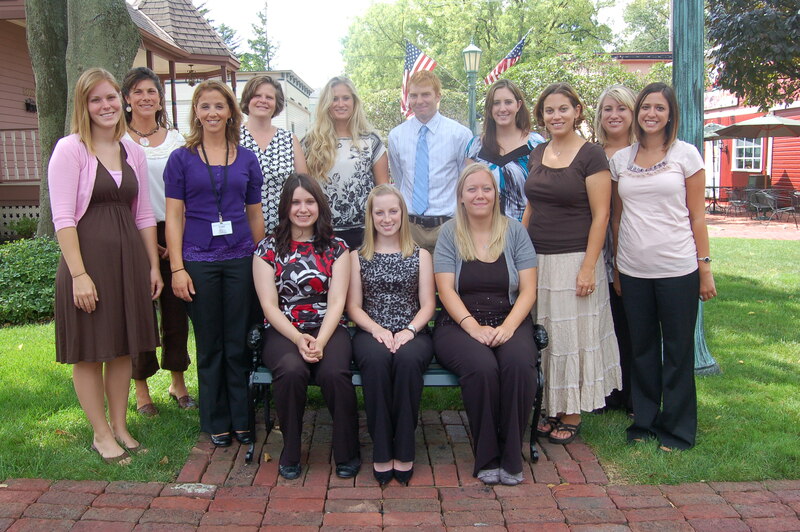 Front Row (Left to Right, including those seated): Megan Stack (Tutor – Falls-Lenox); Deana Harb (5th Grade Teacher – Intermediate School); Elizabeth Ehlke (Tutor – Falls-Lenox); Kristin Ostmann (Science Teacher – High School); Kristina Pekarcik (Tutor – Falls-Lenox); Christine Palmer (Guidance Counselor – Middle School); and Gabrielle Giamboi (Intervention Specialist Teacher – Intermediate School). 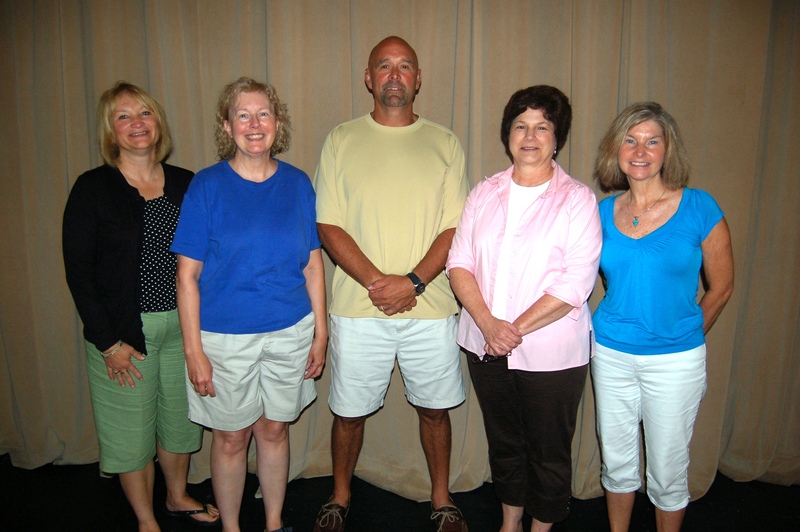 Back Row (Left to Right): Laura Sheldon (Health/Physical Education Teacher – Middle School); Tina Moreno (Speech Language Pathologist – Middle and High Schools); Jackie Moro (Language Arts Teacher – High School); Michael Yurmanovich (Intervention Specialist Teacher – High School); Katie Arnold (Language Arts Teacher – High School); and Amanda Apatzky (Tutor – Falls-Lenox). As many are likely already aware, Ms. Gina Sanfilippo – who served last year as both principal of the new Olmsted Falls Early Childhood Center and assistant principal at Falls-Lenox Primary School – resigned from her position with Olmsted Falls Schools in July. The Board of Education accepted Ms. Sanfilippo’s formal resignation at their monthly Board meeting on July 22nd. We would like to extend our sincere thanks and congratulations to Ms. Sanfilippo for her 18 years of service to the Olmsted Falls School District, and wish her the very best as she relocates to Pittsburgh, where she will be married this fall and will permanently reside. With the school year quickly approaching, searching for a replacement for this unique administrative position presented a unique challenge. We are pleased to report that Dr. Jim Lloyd (Assistant Superintendent) and Mrs. Merritt Waters (Director of Student Services) have volunteered to cover administrative responsibilities for the Early Childhood Center as a team for the upcoming school year. Their offices are being relocated to the ECC this week and they will be in place, along with Student Services Secretary Pam Manas, ahead of the return of faculty and staff to the building on Monday, August 23rd. This new team leadership at the ECC ensures the preservation of the culture, beliefs and values of the Olmsted Falls Early Childhood school experience. Both Dr. Lloyd and Mrs. Waters are uniquely qualified to provide high quality administrative leadership in an early childhood setting, and very much look forward to meeting all of our littlest Bulldogs and their families. Both administrators will maintain their current positions while adding the administrative oversight of the ECC to their responsibilities. 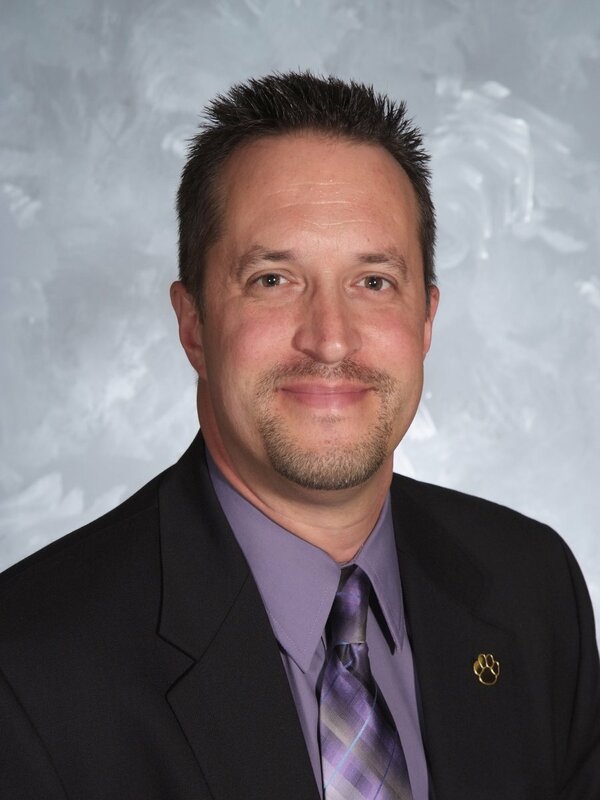 Dr. Jim Lloyd began his career in Olmsted Falls as the District’s School Psychologist, and rejoined the District in August 2007 as Assistant Superintendent. Dr. Lloyd possesses a strong background in early childhood education. His Master’s degree thesis focussed on “Play-Based Assessment” for preschool students. Additionally, he began his career working as a psychologist at an early intervention center. Dr. Lloyd also brings to his new role at the ECC a parent perspective. With three children, in grades 2, 5 and 8, it has not been long since he had his own children in an early childhood education setting. For additional background information on Dr. Lloyd, please click here. 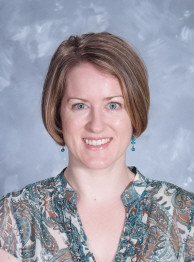 Mrs. Merritt Waters joined Olmsted Falls School District in August 2004 and served as a School Psychologist in the District for four years, prior to accepting her current position as Director of Student Services in August 2008. Mrs. Waters has more than a decade of experience serving as a School Psychologist for preschool and kindergarten students. For additional background information on Merritt Waters, please click here. Mr. Neil Roseberry continues to serve as principal at Falls-Lenox Primary School, which now houses grades 1 – 3 following the relocation of preschool and kindergarten classes to the ECC last year. The District administrative team continues to work towards finding a solution to provide additional support for the faculty and staff at Falls-Lenox. The Olmsted Falls Board of Education approved a new contract for current superintendent, Dr. Todd Hoadley, at this month’s regularly scheduled Board meeting. The five-year contract (effective August 1, 2010 through July 31, 2015) includes a voluntary two-year wage freeze as well as a voluntary increase in the superintendent’s contribution for health insurance. The voluntary two-year salary freeze is a continuation of the administrative salary freeze put into place by the superintendent last year, and therefore maintains his salary at the level approved prior to the 2008-2009 school year. The voluntary salary freeze will remain in effect through the 2011-2012 school year. Additionally, the superintendent also increased his personal responsibility for the health insurance premium to 15% – an increase of 5% over the existing 10% employee contribution share in place for the Olmsted Falls School District. 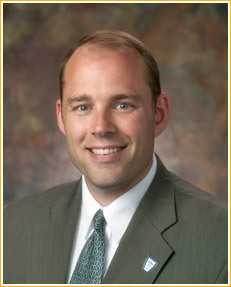 Dr. Todd Hoadley has been at the helm of Olmsted Falls City Schools since August 2005. He lives in Olmsted Falls with his wife, Angie, and their four children, who all attend Olmsted Falls Schools. 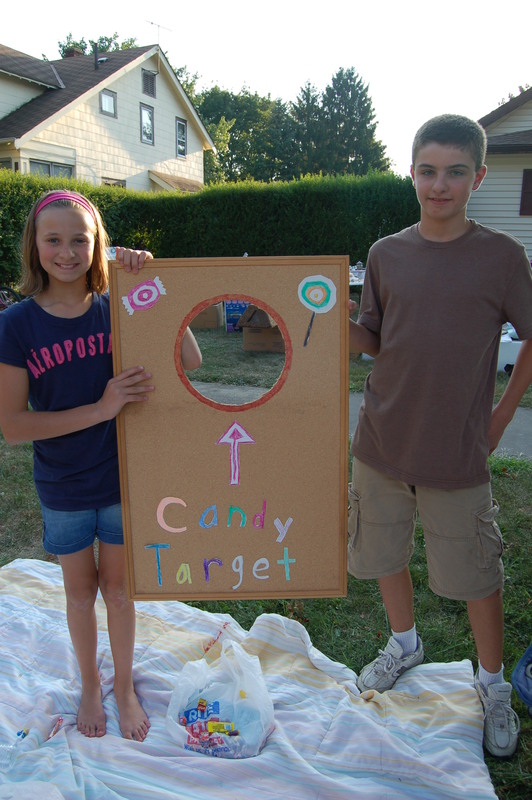 Both Dr. and Mrs. Hoadley are actively involved in local community organizations. DID YOU KNOW? Olmsted Falls School District is an active member of the Ohio Schools Council – a consortium of school districts created for the purpose of saving dollars through volume purchases. Participation in the OSC saves district like Olmsted Falls money on the purchase of products and services such as natural gas, electricity, school buses, and more. To learn more about the Ohio Schools Council, please click here to review the organization’s August newsletter. OFHS mathematics teachers Ms. Donna Langenderfer and Mr. Jeff VanArhem have created an informational letter for parents of incoming high school freshmen (and current 9th graders who may not have a calculator yet) to serve as a helpful guide in the required purchase of a graphing calculator. Click here for a copy of this letter. PLEASE NOTE: The Texas Instrument brand calculators recommended in this letter feature Rewards Points coupons on the boxes that can be collected and redeemed by schools for classroom technology products. Parents are encouraged to save their TI Rewards Points coupons from the calculator packaging and have their student(s) bring them in to their High School math teachers during the first week of school. 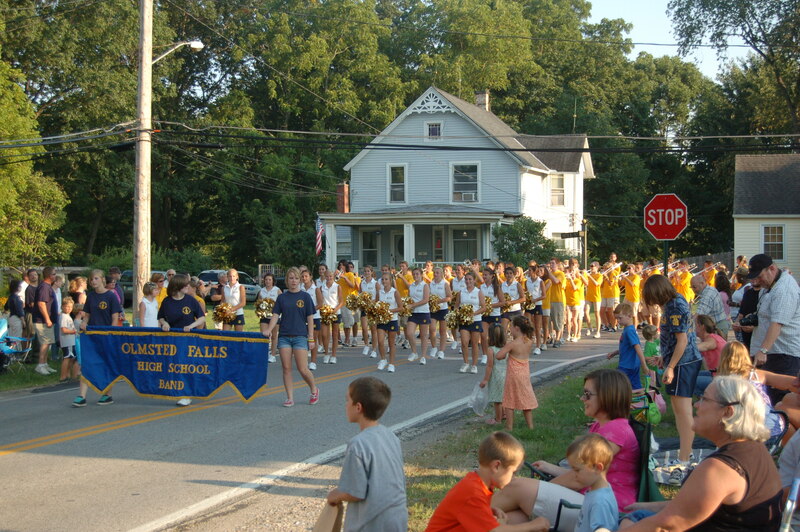 Click here to read the latest news from Olmsted Falls Athletic Boosters. Tonight! Thursday, August 19th – Olmsted Falls Heritage Day Parade – 6:30 p.m.
Saturday, August 21st – Operation Medicine Cabinet – 9 a.m. to 2 p.m. – Pease click here for details on this opportunity to safely dispose of outdated or unwanted prescription medications.